The goal at the Kennel Club’s Emblehope and Burngrange estate in Northumberland is to create a Centre of Excellence for gundog training. It’s a long term project but when you look around it’s easy to see why the area has so much potential. Bracken filled gullies, rough pasture, expansive wetlands and heather all contribute to offering training opportunities for gundogs of any age or stage. 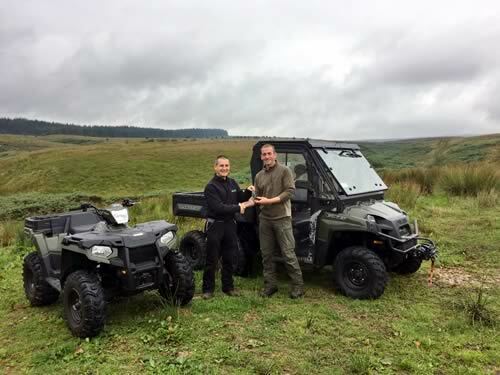 The estate has recently invested in two Polaris off-road vehicles, a Ranger 6 x 6 and Sportsman 570 ATV, supplied by authorised Polaris dealer Davies Tractors of Riding Mill, to help manage the beautiful moorland which stretches to around 7,550 acres. Emblehope is a busy, working hill farm with sheep and cattle. It is also a site of Special Scientific Interest so it is important to minimise damage to the ground in maintaining the estate. A gamekeeper for over thirty years on a number of estates across Scotland, Raymond Holt, as full-time gamekeeper at Emblehope, has the task of ensuring this. As a Centre of Excellence for Working Dogs, Emblehope welcomes the full range of working dog activities such as Field Trials including Pointer and Setter Spring Stakes, gundog working tests and training days, live game training days and working trials through to shooting and gundog activities. The shooting estate offers pheasant and partridge shooting while the varied terrain and woodland cover offer opportunities for all breeds of gundog to demonstrate their natural working abilities.